The trend of creating a smartphone is upon us. Thanks to Apple's iPhone, many company created their own cash cow that would make iPhone cry in envy. We all know that iPhone is all about hype and the emerging smartphones can prove to that. The Philippine community bought an iPhone becuase of the hype, they don't care if the interface is so-so. Anyway, on with the new Nokia 5800 Xpress Music. This baby boast a 3.2" inch touchscreen and two cameras, a 3.2 snapper and a VGA front camera. The usual features like 3G,HSDPA and Wifi connectivity are present. It comes with a 8GB microSD straight from the box which really helps a lot.What concerns me is the S60 OS which is different from the usual Windows Mobile 6.1 of the other smartphones coming out of the market. 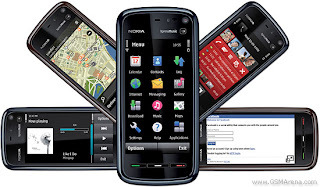 Whether Nokia's faith on the Symbian OS be successful or not depends on the reaction of the users who will use it. All we can do is wait and see.